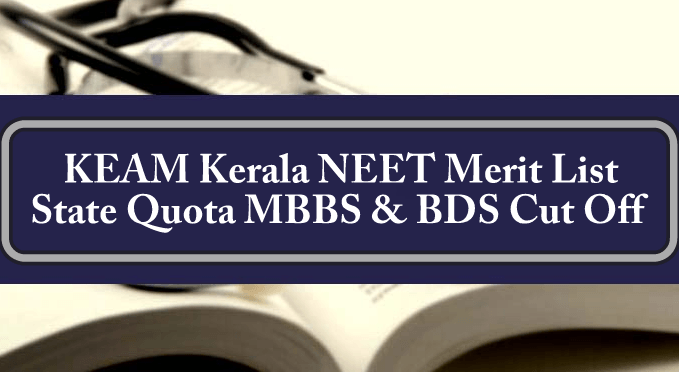 KEAM Kerala NEET Merit List: Kerala Combined Examination Board will announce Kerala NEET State Quota Merit List in the 2nd week of June month on their official website. All NEET candidates will be able to download their merit list from the official website of KEAM. Kerala Commissioner of Entrance Examinations (CEE) will invite online application form for state quota counselling for Engineering/Medical/Architecture/Pharmacy courses soon on their official website. 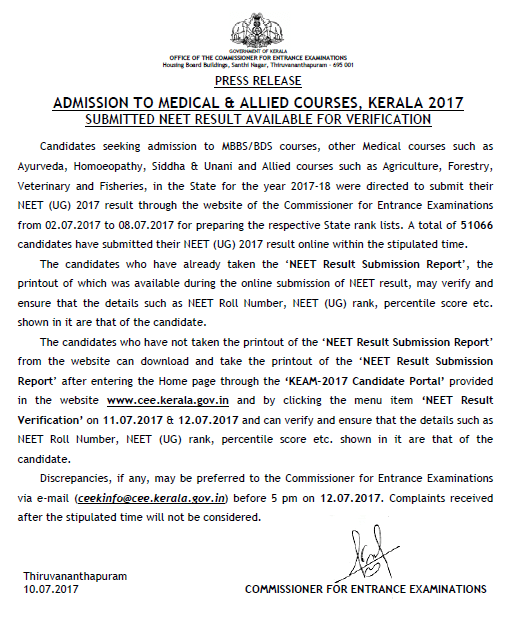 The facility for online submission of fresh application/addition of medical courses will be available after the NEET UG 2018 Result announcement on the official website of Kerala CEE i.e. www.cee.kerala.gov.in. According to our experts, Kerala NEET State Quota Counselling Schedule 2018 will be announced in 2nd week of June month. All candidates are advised to keep checking this page for more latest update. NEET Merit list is announced to let the candidates know that they are eligible for the counselling. It is announced just after the NEET result announcement. In order to appear in Kerala NEET Merit List 2018, all candidates who belong to Kerala state will have to fill the state quota counselling registration form. The online registration application form will also be available on the KEAM official website. After completion of the application form procedure, the board will prepare a state quota merit list based on the score and percentile of candidates scored in NEET UG 2018 Examination. All candidates whose names will be on the merit list be called for the counselling choice filling and locking. The board will soon announce the complete admission procedure and dates on their official website. According to the official report, previous year A total of 51, 066 candidates have submitted their NEET UG 2017 Result online within the stipulated time. This year, total 72, 682 candidates have qualified in NEET UG 2018 Exam from Kerala state. It’s a huge amount number of candidates compared to other states. All Candidates who have domicile of Kerala state can fill the online registration form. Below we have provided previous year’s merit list.